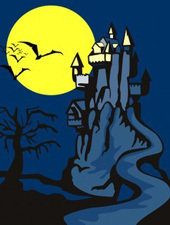 Blog Spooky Story Writing Workshops this Halloween! Every Halloween I run Spooky Story Workshops for children aged between 8 – 12 years and also for teenagers aged 12 – 15 years. These workshops are very popular and lots of fun. By candle light, we discuss all of our favourite creepy books, involving vampires, ghosts, monsters, and things that go bump in the night. We then create characters and settings to terrify our friends, and plot tales of horrific ghouls, vampires, zombies and all things nasty. Workshops take place in Skerries Mills, The Seamus Ennis Centre, The Naul and Newpark School in Blackrock.